Tuesday was one of my favourite yoga teachers. She was also deeply involved in the Phoenix Trust that brought yoga to prisons. She infused calm into to her class and her ways of talking yoga into me were exquisitely evocative. 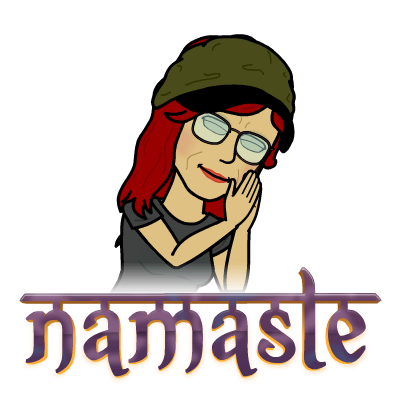 In the early part of the class after we had relaxed in Shavasana and come to sitting position, she would read a passage from a yoga book, to set the tone. 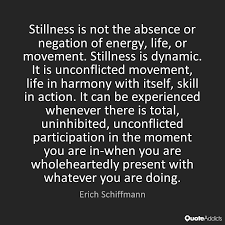 And at the end of the class she would read another passage, often from the same book creating a powerful topping and tailing..
One of her favourite books to quote from was an old and well thumbed copy of Erich Shiffman’s book ‘Yoga – The Spirit and Practice of Moving into Stillness’. It was often only a paragraph, but it always touched me core deep. Before I left for the States, Tuesday was one of two yoga teachers that I hired for a private session so I could record it and take them with me. So, I have listened to her often and still enjoy my practice with her. As I embrace yoga more deeply, I’ve found myself acquiring yoga books. 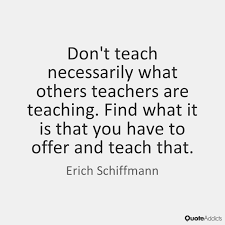 One of the very first was the very Erich Schiffman book whose passages inspired me. I’ve been looking through it, starting to read it again in depth, versus the dipping in I’ve done here and there.. and I am once again entranced and taken into my body by his wording. It’s obvious to me that he is writing from the very depth of his being and he is a skilled linguist, using various ‘hypnotic’ formats that lead the reader to go within and have their own personal experience. He doesn’t force anything, he simply dangles the suggestion and the equivalences.. and it really works even his opening line talks of what he proposes being possibly the most heart-ening belief you might hope to be true. Those words are so well constructed. He acknowledges that beliefs are hopes and that if we believe wisely we can experience all kinds of ‘heart-ening’ outcomes.. And think about it.. the word ‘heart’.. in a chapter that is steeped in love, about love, about goodness.. Here are the opening words to Chapter 2 of his book. The chapter is called The Core of Goodness. Wow! And when you read his words below you will begin to notice in your body how you feel and be inspired.. the more you read, the more you feel this presence… this sense .. this possibility… so find somewhere peaceful to sit comfortably so that it is effortless to absorb the energy of his words..
“As you sit quietly and immerse yourself in the peace and stillness of your own centered being, you will gradually begin to experience yourself in an undistorted manner. You will sink below or rise above your usual sense of self and instead come upon the undistorted, clear, conscious experience of Being – YOUr Being. You will experience yourself as the specific conscious expression of an infinitely expressive Consciousness, Mind, Presence or God. You will thereby intuitively know that you are more than physical and human, that your spiritual existence is guaranteed, immortal, eternal and true and that your Original Nature is absolutely good. You’ll know that you are creative energy, Spirit, a unique expression of God’s infinite Self-Expression and that at your core is Goodness. This is what you’ll experience because in some mysterious and uncompromising way, this IS what we are. We are all made of God Substance, Consciousness, Love. As you sit in stillness, experiencing the energetic feeling-tone of You, you will invariably begin to feel exquisite inside. You will begin to feel at ease, deeply relaxed, natural, perhaps for the first time in a long time….. and as you relax, and as you feel the energy you are made of, you will begin to feel loved. You’ll find yourself feeling this way, inevitably, eventually, as you relax inside and allow yourself to become increasingly in touch with the loving goodness that is already in you… and it is already in you because that’s how you were built. Love is the all constituting substance of Being. It’s what you are made of and you did not create yourself. And I love his advice on teaching yoga.